I returned last week from the Christian Camping International -Worldwide Summit in Spain with wonderful people who are leading Christian camping associations in 19 other countries. It was a rich time of sharing challenges, successes, ideas and needs with one another. I am encouraged by the growth of the Christian camping movement around the world, and by the passion of the people God has brought to the work, and I am honored to be a member of their global team. During the summit I was struck by the durability of our cause, that some Christian camps have celebrated over 100 years of ministry, even while new CCI associations are just getting started in countries like Albania. But a field trip to Segovia, Spain, gave me a new perspective and a sense of awe. 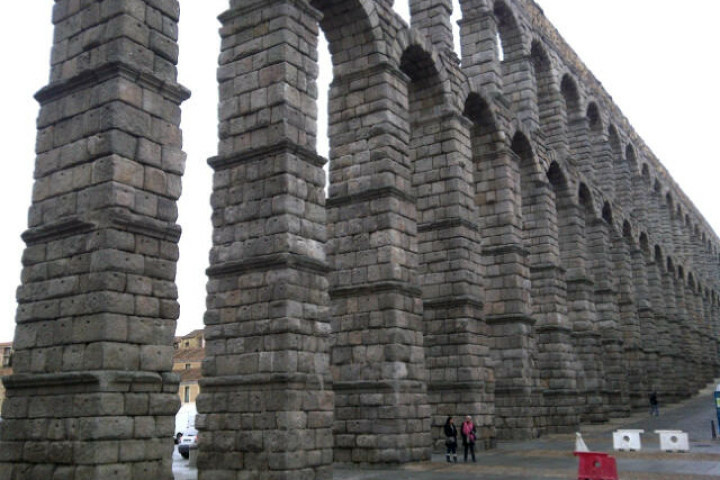 The first landmark we saw as we exited the bus was the Aqueduct of Segovia, a working aqueduct that the Romans built in the first and second centuries. An impressive structure that was constructed with some 25,000 huge granite blocks and no mortar, it stands nearly 100 feet tall at its highest point. (Side note: I’m building a small retaining wall in my yard using cinder blocks and no mortar, and I’m not sure how long it will stand.) But looking up at the lower-level arches, which stand about four stories high, I was blown away by the engineering that has enabled these un-mortarted stones to stay in place for so long. The entire visible length of the aqueduct gives the feeling of permanence and stability. Standing beneath the structure taking pictures, I made the connection between this great stone landmark and the faith represented by those of us engaged in Christian camping. And in the context of this worldwide gathering of Christian leaders, I was reminded of the strength, stability and permanence of our message, our purpose. Some of us have been involved in Christian camping for just a few years, while others have spent decades on camp properties. But regardless of your years of service, I hope you’ll be encouraged as I was by the reminder that God’s message of Good News through His son Jesus stands firm, is not shaken by the passing of time, and is carrying hope to a new generation of people all around the world. Whether it is physical training which the Romans did a significant amount, or getting our camps physically ready for the summer this has some value. BUT, the Biblical principles we teach will have value for this life and the next! Another striking feature of the aqueducts is the capstone. So much like Christ. Without the capstone, the whole thing comes crumbling down.